On March 23-25, more than 35 women celebrated the 20th anniversary of the Women’s Retreat Weekend at the retreat center in Groton. The mid-winter retreat was launched by CCoL’s Associate Pastor Rev. Sally Calhoun in 1998, asking Connie Turner to be the registrar. “Sally did all the rest,” said Connie. 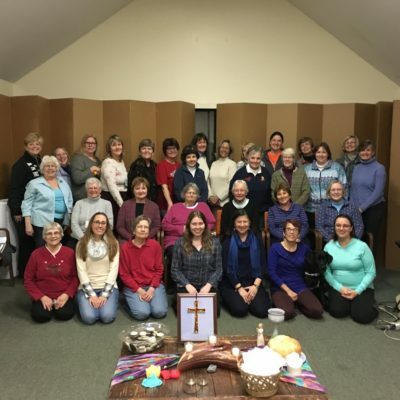 CCoL women, including friends from the First Baptist Church have continuously gathered at St. Benedict’s Abbey in Harvard, and the past three years at Grotonwood Retreat Center. Friday night check-in is typically a social event – an opportunity to unplug and unwind, reunite, sing, laugh, games and handcrafts – the knitters, weavers, needle pointers shift to high gear. Saturday’s day-long themes have included the Twenty-Third Psalm, Women of Strength, The Prodigal Daughter, the stories of Ruth and Lydia, Practicing Hospitality, God in Everyday Life, Prayer and Our Bodies, Hymns and Their Histories, Women of the Bible, Lent, and this year, Finding the Blessing in Transition. Themes weave throughout the day through song, writings, scripture and reflections. Retreat leaders have included Sally, Rev. Elaine Gaetani, Rev. Peg Wallace, Connie Turner, Rev. Barbara Keast, Rev. Susie Allen and Rev. Lee Atherton. Committee leaders over the years have been Connie, Jeannine Scantlebury, Linda Cahill and Barb Keast.